Welcome to the corner of Oakmount Road, Oakmount Road, and well…Oakmount Road. Unlike boring ol’ run-of-the-mill streets, with their logical linear paths, Oakmount forks, going in three directions, creating what might be one of the oddest intersections in the city. 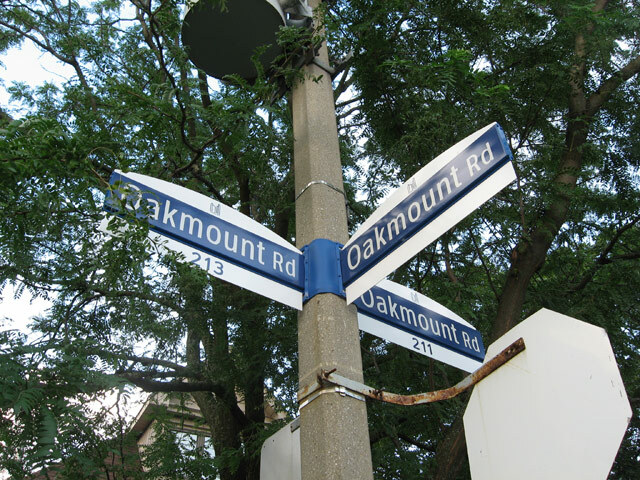 For most of its length, Oakmount runs parallel to Keele Street, just north of Bloor Street West. It only splits near its northern end. Afterwards, the western part of the street continues until Pacific Avenue, while the eastern part merges with Medland Crescent. Why the fork exists isn’t entirely clear. 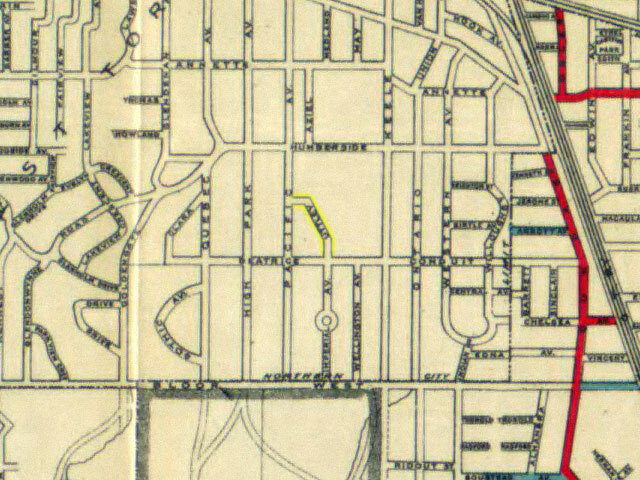 According to City records, Oakmount, which used to be known as Uttley Street, was created in 1884 by the Village of West Toronto Junction. 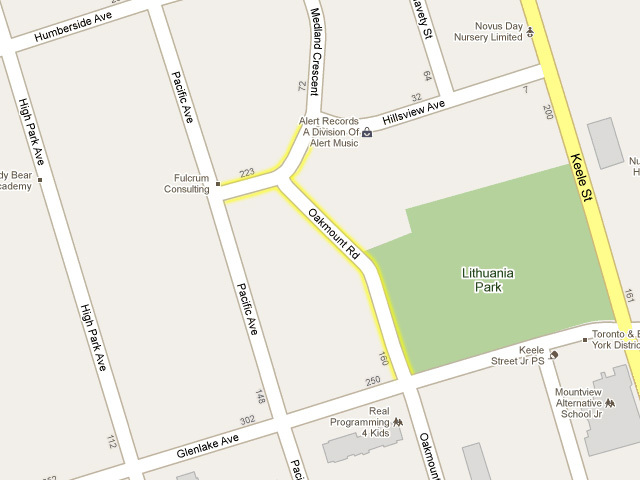 It was later changed to Oakmount in 1911 by the City of Toronto (the City merged with the Junction in 1909). City maps from the period reveal that Oakmount’s eastern spoke was built sometime after the rest of the street, between 1910 and 1915, while City records indicate that Medland was laid down in 1911. The road outlined in yellow is Uttley Street, before it became Oakmount Road. Plan of the City of Toronto, 1908. To find answers, we contacted Kerry Ferguson, titles and status supervisor at the City’s Surveys and Mapping department, and Neil Ross, a historian with the West Toronto Junction Historical Society. But unfortunately, they could only offer us theories. Ross, on the other hand, suspects that the “system of creeks and rivers” that run through the area might have played a role in shaping the street’s odd path. Of course, Oakmount isn’t entirely unique. Toronto’s twisty, windy suburbs contain dozens of streets that loop around and intersect with themselves, like Hearst Circle, Valecrest Drive, and Decarie Circle. There are also plenty of streets that undergo random name changes for no apparent reason. The worst is probably Blackthorn Avenue, which turns into Haverson Boulevard, restarts somewhere else, abruptly ends, then restarts again. Or maybe Oak Street, which turns into Gary Drive, then PELMO Crescent, and then Woodward Avenue. Oakmount’s confusing intersection could probably be fixed by extending Medland and eliminating the eastern part of Oakmount Road—though residents probably wouldn’t appreciate having their addresses changed. And as we’ve learned from other surveying snafus, it’s probably easier to bulldoze and start again than to effect a street name change.